Call us at 317-986-6785 so we can pick a time to visit and discuss your current retirement plan and financial goals. 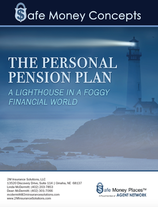 What is a PERSONAL PENSION PLAN? The old retirement model of past generations is gone. Back then, along with the gold watch, the company could expect to only pay retirement benefits for 3-4 years. Today's retirement period can last 25, 30, 35 years or more. The new retirement model is all about longevity. That is why the Personal Pension Plan is important in assuring that today's retirees have an income guaranteed long after the gold watch has quit working. Finally … how much do you need and when do you need it? Need help filling your income gap? Hale and Associates does not warrant anything on this website, although we hope everything is accurate. We do not provide tax, legal, accounting, or investment advice. We are not responsible for any independent decisions made from information found on this website or links provided to external websites. You need to conduct your own research and consult with a representative of Hale and Associates or your own financial professional about your personal situation before making any financial decisions. Hale and Associates provides links from its website to various third party sites which may enable you to obtain locations and information outside of our control. We neither controls nor endorses such other websites, nor have we reviewed or approved any content appearing on them. Hale and Associates does not assume any responsibility or liability for any materials available at these websites, or for the completeness, availability, accuracy, legality or decency of these sites. © COPYRIGHT SMP INTERNATIONAL LLC 2019. ALL RIGHTS RESERVED.